On first look, salads too seem very healthy, but oily dressings can undo the very intention of eating salads! In the collection of salads in this section, a lot of fresh fruits and vegetables have been used and substituted oily dressings with healthier alternatives made using lemon juice, Low Fat Curds, fruit purées, and such. Revel in the goodness of really healthy salads like Cabbage and Apple Salad, Green Salad with Muskmelon Dressing, and Roasted Mushroom and Coloured Capsicum Salad. And why restrict making salads to only fruits and veggies. 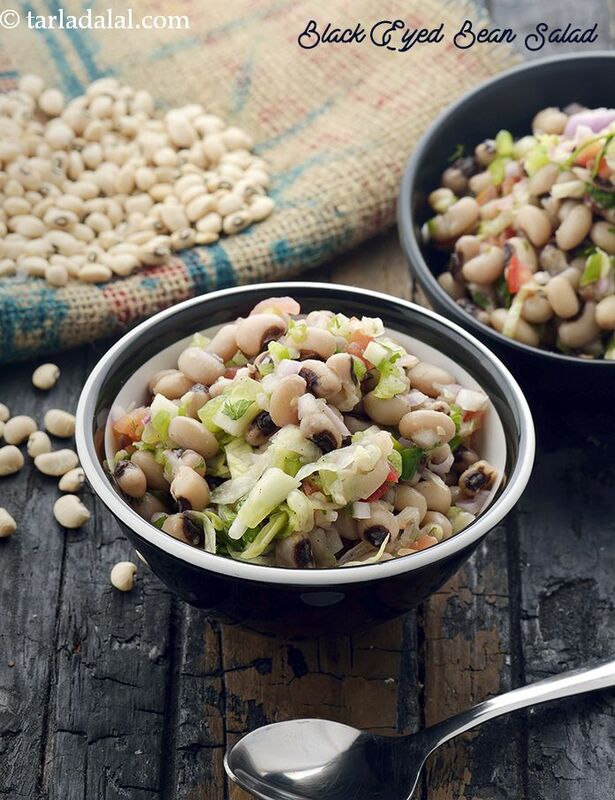 Combine them with cereals, pulses and sprouts to make interesting delicacies like Bean Sprouts and Suva Tossed Salad, Barley and Corn Salad etc. Time to make a culinary trip to Indonesia, with this scrumptious Gado Gado Salad! Loaded with colourful and juicy veggies, dressed in a unique peanut sauce that combines nutty, sweet and tangy flavours, this delectable salad is a super-tasty antioxidant booster!